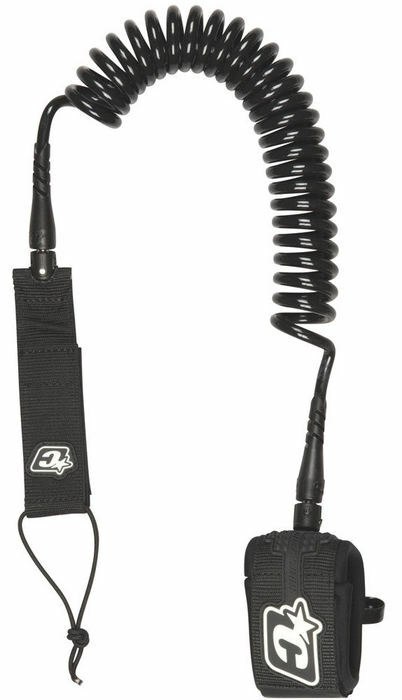 4	stars -	"Review for Creatures of Leisure SUP 10 Coiled Ankle (3m x 8mm) Black Leash" Mark Taylor This Creatures of Leisure SUP 10 Coiled Ankle (3m x 8mm) Black Leash is the best SUP Accessories I have tried. DNA FLEX MOULD is bonded to the leash cord in such a way that the two stretch together when under pressure. This unique design allows a DNA leash to absorb greatly impact than a regular leash, improving flexibility & strength preventing breakage. THE BEARING SWIVEL is a patent pending / registered design and another world class first innovation, exclusive to Creatures of Leisure The Bearing Swivel lubricates itself as it spins ensuring continous, friction-free rotation and longer life for the swivel itself. The unqiue design prevents the swivel from becoming 'stuck', eliminating leash tangles. Made from marine grade stainless steel and self-lubricating bearing plastic its virtually unbreakable and resistant to corrosion. The Bearing Swivel is a patent pending / registered design and another world class first innovation, exclusive to Creatutes of Leisure. SURE FIRE RELEASE SYSTEM. If you wipe out and your board becomes snagged underwater, the first priority is to separate yourself from your board. Creature's new SureFire Release aids the separation process thanks to a unique urethane coating that keeps it permanently upright in a easily accessible loop. Simple, smart, dependable... and very handy in an emergency. SureFire Release is another world first innovation exclusive to Creatures unique urethane coating keeps the leash release tab permanently upright in an easily accessible loop.